In spite of the fact that I neither play nor watch sports, I really enjoyed a well written sports novel. There’s just something about the game when it’s rendered into a well told story that really gets to me. So it’s no suprise that I liked Keeper by Mal Peet. Keeper is the story of how a professional football player became a World Cup winning goal keeper. Part ghost story, part sports story, Keeper starts after the hero has won the World Cup and tells how, as a young boy in the Brazillian rain forest, he learned how to be a goal keeper from a ghost he met in the jungle. This is a strange mix of elements. Along with the ghost story we learn what it’s like to be a worker in the Brazilian lumber industry, what it’s like to be a world class soccer player, and how to play soccer. All of this worked very well for me. I’m not really interested in how to be a good gool keeper, but these passages were fascinating none-the-less. The ghost story elements add a measure of suspense and danger to the story. The depiction of growing up in a very poor community inside the Brazilian rainforest was compelling as well. 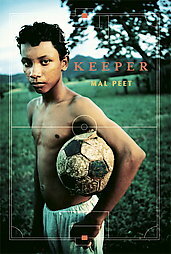 When all is said and done, I’m giving Keeper by Mal Peet four out of five stars. Combining a ghost story with a soccer story should make this book very appealing to boys, especially reluctant readers. Anyone who enjoys a good yarn will find it in Keeper. I first published this little review back at my old blog Ready When You Are, C.B. back in September of 2007. I’m rerunning it here even though it’s not a very good review because it is a very good book. Maybe someone will read it as a result of reading this post.